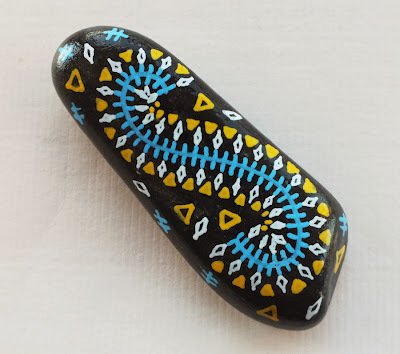 Aside from their appeal as personal talismans and small works of art, Alchemy Stones also make nice gifts for the holidays-- not only for people with an interest in metaphysics, but for those who appreciate hand made items. We are currently offering Free Shipping on any purchase from our Alchemy Stone shop on Etsy, until the beginning of 2014. All you have to do is use the coupon code "FREE1213" when placing your order and checking out. There are many new items listed for the holidays, with more being added daily. Recently, I have been experimenting with brighter colors, and some of the designs have been turning out really well. Although my original drawings were always done in black ink on white paper, I really like the additional "dimension" of adding color. 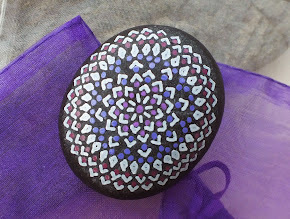 Color also enables me to use the stones in ways that make the designs clearly visible-- always a challenge when work with black on a darker stone base. We recently took Alchemy Stones "on the road" to a local Holiday Fair, and they were quite well received-- it was exciting because it represented the first time we'd taken the stones "out in public," as opposed to only having them online. We'd like to wish everyone Happy Holidays, and hope you'll make Alchemy Stones part of your gift giving plans for the season!